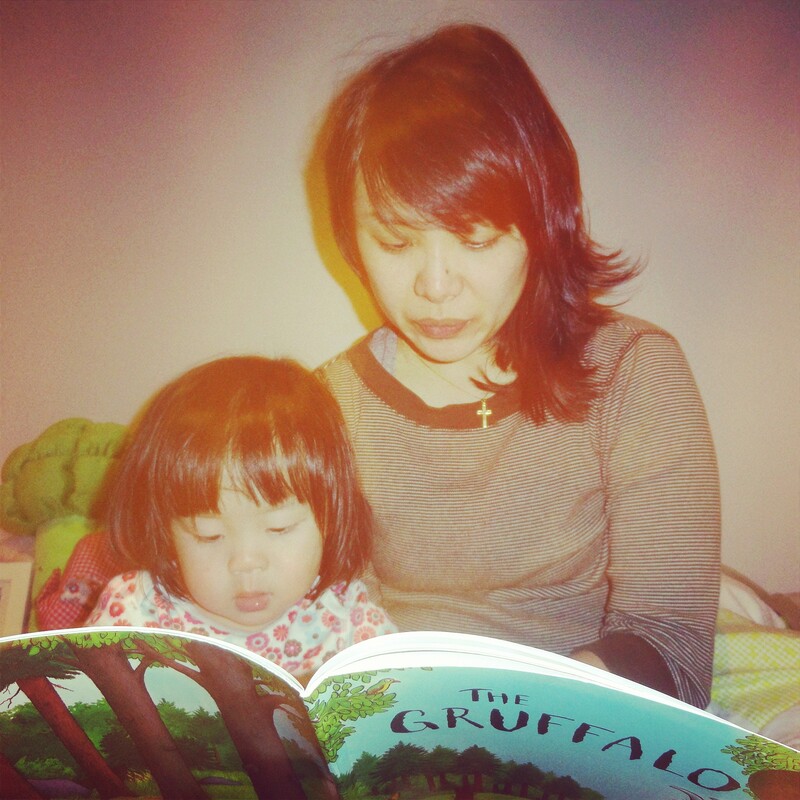 So I had a minor-major mum moment on Sunday where I realised, slightly tearfully, that my baby is well and truly growing up. 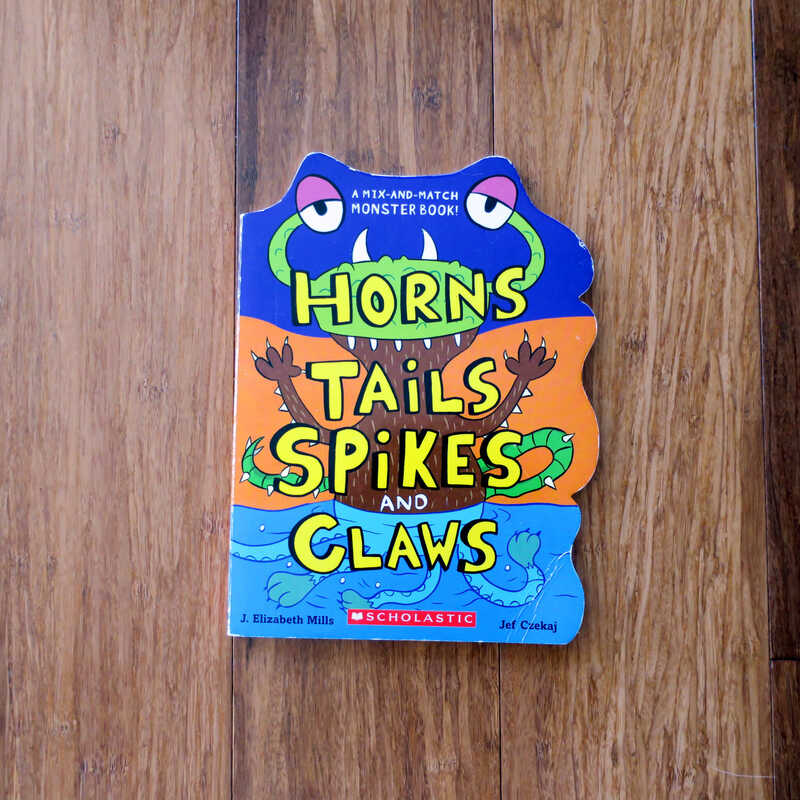 Horns Tails Spikes and Claws by J. Elizabeth Mills and Jef Czekaj was one of my opshop finds a few years ago. It’s one of those mix-and-match books you can flip different parts of it to make strange and funny combinations of stuff. I got it in the hopes that Iris would entertain herself with it. She never really got into it so a month ago just before my last blog post, I decided it could go in the giveaway pile along with another similar book. Last week, I took the pile out ready to give away to friends and family. This particular one was going to a friend with boys who might appreciate such humour more. From about Thursday she started flipping through the book and had a bit of fun with it, which I thought was just her usual reluctance to give her stuff away thing. On. Every. Single. Page. IN INK. Now anybody who loves books will surely understand my abject horror when I saw a previously perfect book being desecrated. I was livid but in a moment of supreme control, which still amazes me, I did not immediately yell but told her that she’d have to be punished by not getting her allowance the following week (more on financial matters later). I then said I was so angry I couldn’t even talk to her anymore and went upstairs to get ready for church. Not sure if it’s a good or bad sign but it seemed that my not yelling indicated to Iris that it wasn’t a big deal, because 15 minutes later she seemed to have forgot the whole thing. So, still not quite yelling but perhaps a bit more hysterical, particularly with crazy eyes, I asked her, knowing that she should not have done it, to think about and tell me why she did what she did. It hit me like being bowled over by a 20-kilo six-year-old that not only had she grasped the true intent of her feelings, which to my mind is pretty mature for a kid, but she admitted it to me and expressed it like such a big girl that I started tearing up immediately. I gave her a big hug and told her how proud and grateful I was that she was being so honest. This is why husband and I still steal into her room every night to look at her sleeping because it is only then that she still looks and behaves like our little baby. It’s utterly hilarious that despite knowing (and often wanting) that our children will grow up, just like how we know we’re all going to die, we still react with such shock when we see it happening. So please excuse me while I go sniff and cuddle Iris’s baby clothes. Yes, she is growing up. Bless. For us mum’s it is happy/sad.